I know this is about the mountain, but for me it was about the fact that I showed the world my legs for the first time since puberty. Not only did the world not implode, it didn't even notice. For so many reasons, I am excited for summer. Or that winter is over. For one, my dissertation is no longer hanging over me (it's too early to celebrate, but it is out of my hands at least!). 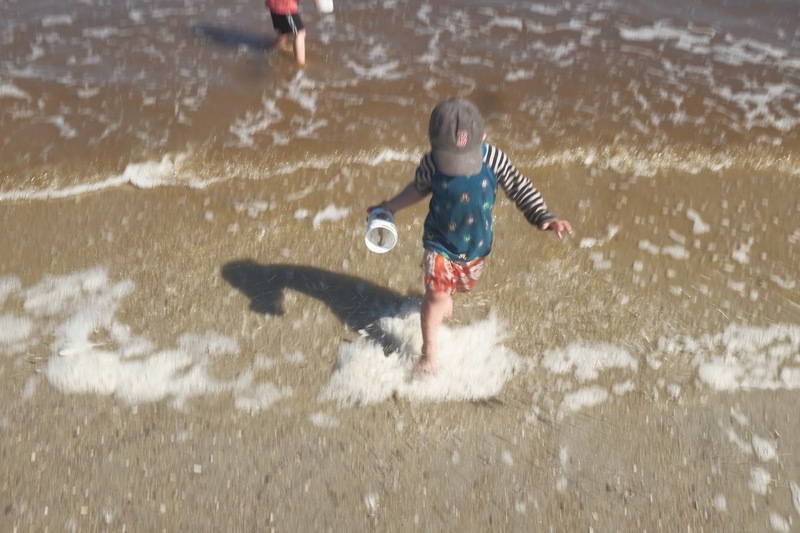 For another, we are getting out more, and there is nowhere I am happier than the beach. It also means that we made it through our first winter without a car. Looking back on the past year or so of biking, I am surprised by how much I have changed.When I am on the bike I feel how riding fundamentally shifts my perception of myself. It has affirmed my hope for myself: If there is one thing I seem to want, it is to be considered strong, by myself and others. Not just physically strong, but resilient, you know? And part of that is totally oriented around God, around the sense that I don't have to fight for myself. And another part is totally oriented around myself, where I'm totally fighting for myself and winning (see dissertation). Which is to say, a bike is probably a good vehicle for self-reflection (and narcissism). Inconvenience aside (or glossed over for the purposes of this post! 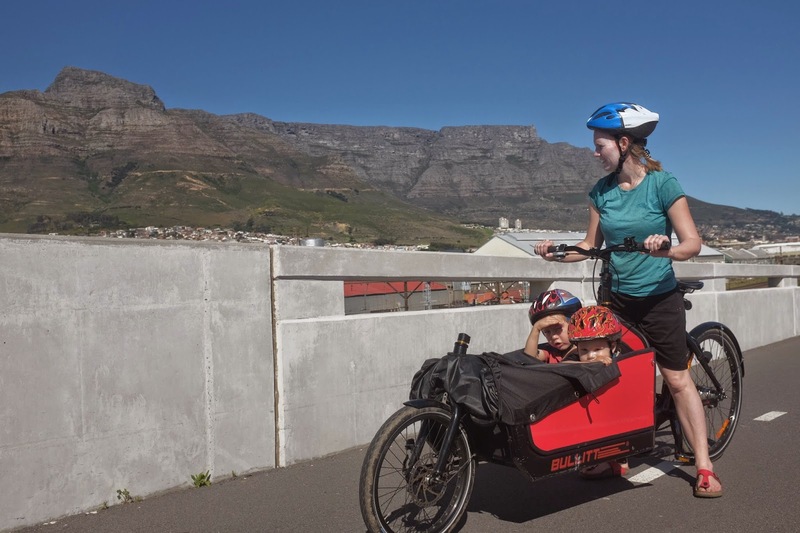 ), it is amazing to have gone through winter, with small kids and a vaguely middle-class suburban Cape Town lifestyle, without a car. I know not many people will think it practical just yet, but every day we bike, I get more excited at the potential it presents. We've renovated our house to put it on the market, and surprisingly, it was actually easier without a car. Rather than go to the massive Builder's Warehouse, Eug found all the small shops in nearby Woodstock and Salt River, where the shop workers are super competent and give great advice, lines are non-existent, and he buys exactly what we need for the next week. When we buy gas canisters for our stove from the petrol/gas station, they get the canister the moment they see us pulling up. 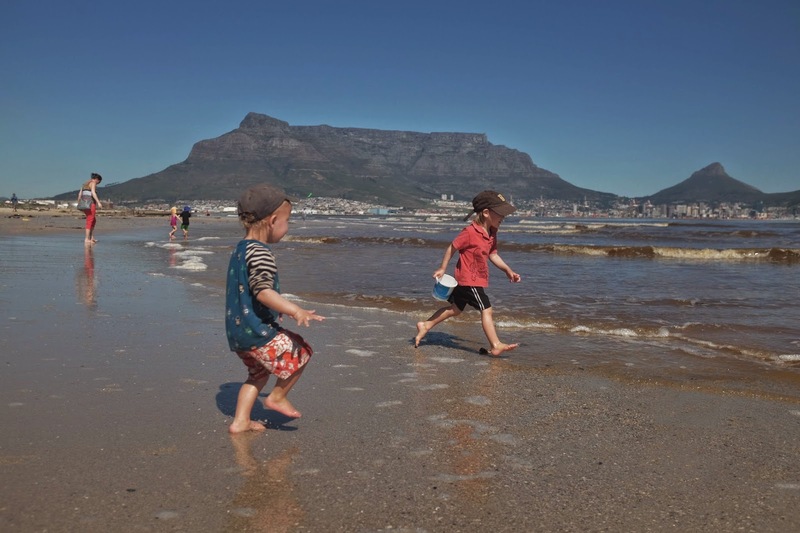 From our recent ride to Milnerton: Biking from Obs-Milnerton beach is great on a Sunday, but tough on other days, because it involves Albert Road. Albert Road is set to get a painted bike lane, so this may help. Right now, cyclists have to go in traffic along Albert, which on weekdays has tons of traffic and double-parked cars, and a killer traffic circle (which you can always walk your bike across, if you don't feel comfortable). Once on the bike path at Woodstock, the ride is lovely, sharing the MyCiti route. As Spring arrives, we are mark almost 3 years since we left Boston and a little less since we arrived in Cape Town (we arrived Dec 6, 2011). And so it is a time of change. We've put an offer on an acre of vacant land in Noordhoek/Capri, and 6 years after praying with our small group during lent for a tiny house, it looks as though we will have our own tiny, off-grid house (although it won't be quite as tiny as many are- probably around 36m2). Amazingly, it is financially neutral, as we're moving to a much cheaper area and building a very small house. More on that soon. It feels like a very hopeful faith-building time. I recently had a discussion with a friend about the ice-bucket challenge, where I shared, not very deeply, that such challenges scare me, though I couldn't really articulate why. She suggested that people sharing about what they give, and who they give to, could be a powerful vehicle for social change. In that spirit, I felt like talking about what we did with the money we got from selling our car. When people see the Bullitt they always ask how much it cost, and I always say vaguely how much and they sigh and say that it would be impossible for them. This sometimes leads me to say that we sold our car and actually it cost the same as a cheap car, and costs almost nothing to run as compared to a car, which requires petrol, which is edging up to R14.00/L. I say this because I want to seem the same as them, and I want them to feel like this is a change they could maybe try out. Usually, the people asking have professional full-time jobs, which immediately means they have an income that is many orders of magnitude more than our family's income. But I also do feel pretty rich, and I'm on a bike, I probably smell bad, the kids are somewhere nearby, and I don't want to seem too weird or start up on a financial conversation about why the Bullitt might make financial sense. Anyway, on to selling our car. We have this thing that cars have mainly felt like gifts to us, and we've also found it useful to consider cars sunk costs (although hopefully we don't have to buy a car again for a long time!!) so we've always either given away the car or given away the money from the sale of the car. Which is not like a million cars: Eug and I have been married almost 8 years, and had 3 cars during our marriage. Anyway, so this time when we sold the car we gave the money to the Bicycling Empowerment Network. 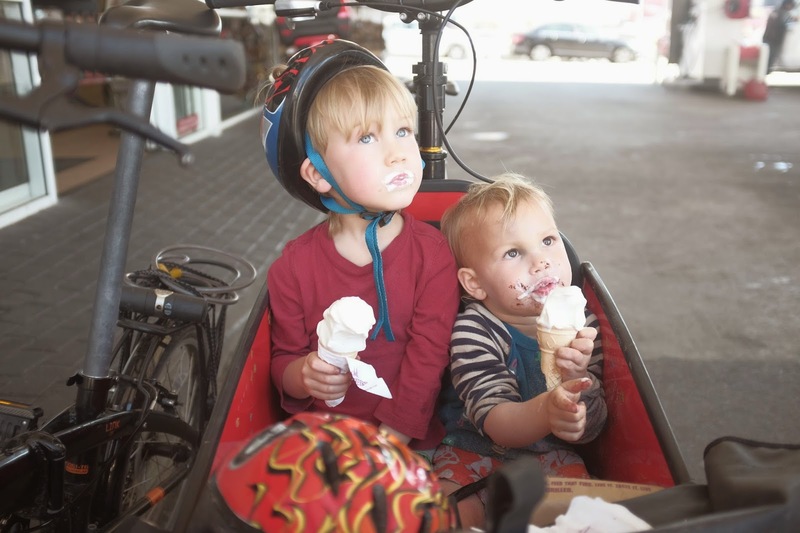 We don't know that much about them, but we liked that they seemed to be interested in making cycling in Cape Town more than a middle-class hobby, and they seem to have a dream that we'd love to share. We also liked that we can hopefully visit and hang out with them, as they're just around the corner from our plot in Masiphumelele. The money for the car would have constituted quite a big amount for us, so I guess my point in sharing this is that our experience is that outwardly strange financial decisions have all these other dimensions. Even though we've never met the people at BEN, we feel like we're part of their story, which is pretty cool. We are ending our warm season over here so it's weird to hear you talk about your spring starting... I am half excited for you and half jealous and half uninterested in things that don't have anything to do with the season I'm in. I wonder if broadly speaking the same thing could be said about life-stage conversations? When our lives are different from those of others, sometimes we're excited to hear about it, sometimes we're jealous, and sometimes we're so challenged we just want to shut out the information?